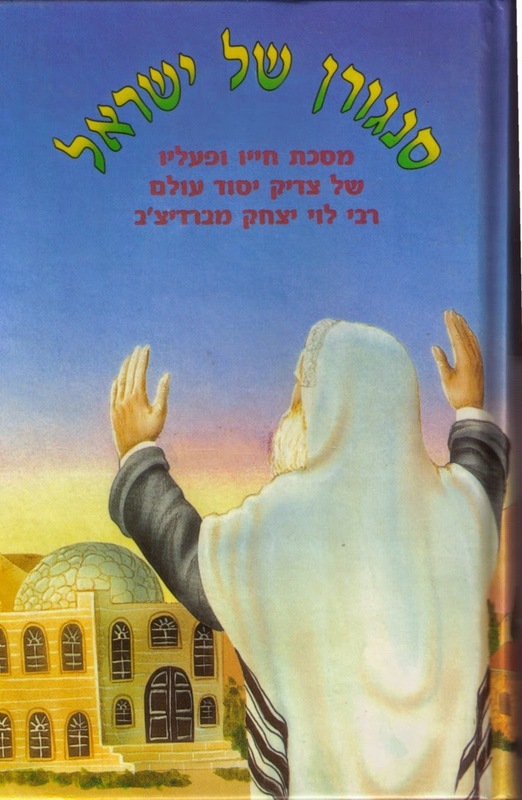 Rebbe Levi Yitzchak of Berditchev comes to....Gaza! After a long hiatus, I could not resist sharing the following story, which was posted on the Cross-Currents site. I have done some light editing, added some links and a picture. I cannot reveal my source. All I can say is that it happened as he patrolled late at night in a Beit Hanoun street abandoned by its residents, walking a few paces ahead of the rest of his unit. He saw a figure, standing to the side, shrouded in light. “Shalom alecha, my son,” he said. His voice was redolent with peace and tranquility. My friend instantly realized that this figure was not of this world, and responded, “Shalom alecha, rabi u-mori. I presume that you are Eliyahu ha-Navi?” The figure smiled. “Not quite. They used to call me Levi Yitzchak, and I have been watching the events here with keen interest. I had to come back to revise one of my more famous songs – A Din Toyre Mit G-tt.” He handed my friend a handwritten scrap of paper, and vanished into the night. Good morning to You, Ribono shel Olam. I come to you with a Din Torah from Your people, Yisrael. What do you want of Your people Yisrael? Merciful Father! How many nations are there in the world? The Scandanavians, what do they say? That there is no G-d. The Persians and Arabs, what do they say? That G-d is a bloodthirsty maniac. And the English, what do they say? That G-d is no longer relevant. But Your people, Yisrael, what do they say? Ani Ma’amin. Yisrael b’tach baShem. These are the songs their sons sing as they march to and from battle with those who scoff at You. While the enemy sends their sons to burrow through the ground in the hope of slaughtering the innocent. And those nations look on, and heap scorn and hatred upon us for simply surviving. After two thousand years of exile, they have learned to tolerate us. But only if we are dead. If Yisrael and its Torah and You are all One, Whom do they really malign? Is it not You they ridicule, not just us? A few weeks ago, I thought I understood what You wanted. You have always chastised us, because You care about us, and discipline us for our good. But You have always warned us first. You told us that if we would follow You inconsistently – b’keri – You would do the same. We have been guilty of that. But surely You have taken note of how this holy nation has lived in the last weeks, steadfastly turning to You – even those who ordinarily don’t bother? Was it not a special moment when a government official who had not entered a shul since his son’s bar-mitzva searched his house for his grandfather’s Siddur so that he, too, could turn to You with the rest of the country? Did You not take pleasure in the Shema Yisrael spelled out by the lights of a tower in Tel Aviv, the “secular” city? How often before did You witness tens of thousands of people gather to beseech you, observant and non-observant together, as they did there when we still thought that the three kedoshim were alive? You warned us again in the Gemara that the galus would be prolonged because of sinas chinam. Have You ever witnessed as much ahavas chinam as in the last week? Thirty-thousand people attending the levaya of someone they did not know? Lines down the halls of hospitals, strangers waiting patiently to offer words of encouragement to wounded soldiers they never met? Hordes of people descending on the border (despite the rockets) to offer gifts to the soldiers of Tzahal fighting for Your honor? You warned us not to fall into the kochi v’otzem yadi trap. You got us on that one! Close to five decades ago, You granted us a spectacular victory. Some realized it was from You; too many others credited the might of their planes and their prowess. Years and years went by, and with few exceptions, the Rosh Memshala did not speak about You. He put You first, where You belong. You must have noticed how different the mood is this time. With all the success of the technology You have given us the intelligence to design, more people credited the Big Kippa than the Iron Dome for our incredible salvation. If this is not full, national teshuva, does it not count at least as a full national chudo shel machat? What more do you want of Your people Yisrael? We will gladly do it – so long as You will allow us to come closer to You, and You will continue to show Your love for us. The others continue to blaspheme You. From my stand I will not waver. until there be an end to this exile. על פרשת האברך החשוב אליאור חן שליט"א, מהי האמת ?